At the age of 14, Etheldreda was married to Tonbert. Now some saints have run away from marriage when they felt called to the vowed religious life, but Etheldreda trusted in God. She accepted the wedding calmly and found that Tonbert was equally devout and was happy that they should live in continence. After three (or five) years together, Tonbert died. For a time she enjoyed the solitude of the island of Ely, which had been part of her dowry, but for reasons of state she married again. Her second husband, Egfrid, son of King Oswy of Northumbria, was just a boy at the time. Etheldreda, though still young herself, treated him as her son or brother, rather than as a husband. She taught him the catechism and directed his spiritual growth, clearly trying to prepare him to accept a marriage of continence. 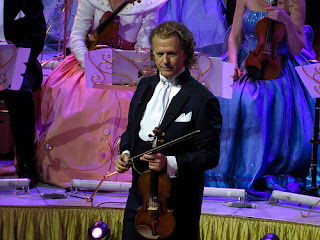 But after 12 years of this relationship, Egfrid, grown to manhood, tried to make her his wife in fact as well as in name. This alarmed Etheldreda, who then sought the counsel of Archbishop Saint Wilfrid of York. He released her from her marriage and advised her to withdraw to the Benedictine abbey of Coldingham. At last she was able to fulfill her heart's desire. She took the veil at Coldingham under Saint Ebba. At first Egfrid tried to persuade Wilfrid to order his wife to return to him, but without success. In 672, she founded a double monastery, where the present Ely Cathedral now stands, and ruled it as abbess. Egfrid dispatched armed men to Ely in an attempt to force her to return, but the expedition was unsuccessful. From the time founded Ely, Etheldreda ceased to wear clothing of fine linen and dressed only in woolen garments. Except at Easter, Pentecost, and Epiphany, she washed only in cold water. Only when she was ill or on great church festivals did she eat more than one meal a day. She prayed for those who did not pray and often kept vigil in the church from midnight until dawn. Seven years after the foundation of Ely Abbey, she died of the plague. In art, St. Etheldreda is crowned, holding a crozier, book, and a budding staff. Sometimes she may be pictured (1) asleep under a blossoming tree; (2) with a book and lily; (3) as a fountain springs at her feet; and (4) as the devil flees from her. Etheldreda is the patroness of Cambridge University, and those suffering from throat and neck ailments. saint of the day women saints. A great Saint and an ideal one to talk about here! St Audry pray for us. Pleased to read your history. My Church is St Joseph & St Etheldreda Rugeley and we have been given a statue of her by the Dominican sisters at Stone where once the relic of her hand was kept. The statue has been restored and was placde in our church today. I was particularly pleased to read that St Ethledreda was moved to pray for those who don't pray. Our church is dedicated to the Joseph & Etheldreda because the two principal benefactors (1853)were Joseph Whitgreave and his sister Sr Etheldreda of Princethorpe Abbey. 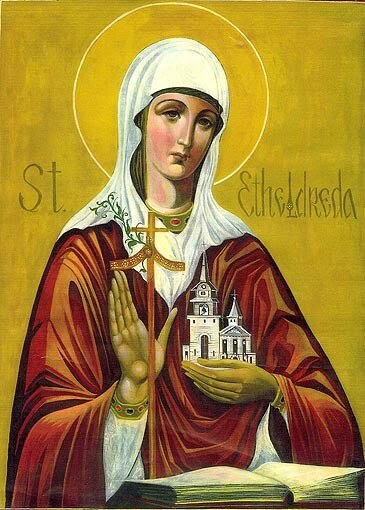 St Etheldreda pray for us.